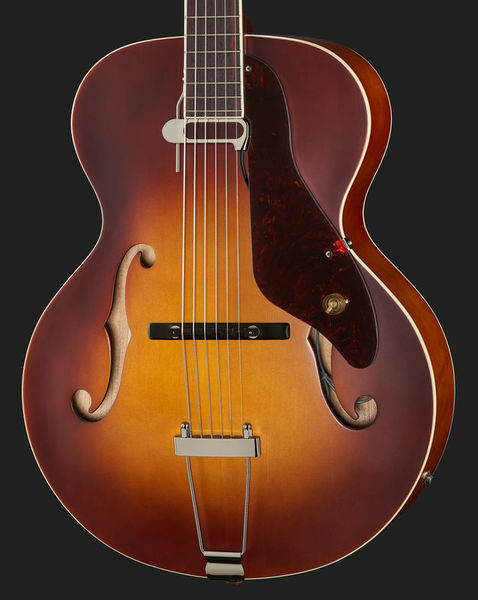 The Gretsch G9555 New Yorker Archtop with Pickup brings back the classic 1950s hollow body archtop design. With a gorgeous antique semi-gloss sunburst arched solid spruce top and a tortoiseshell pickguard, this hollow-body guitar offers good looks, along with excellent tone and effortless playing action. Other features include laminated maple sides and arched back, custom wound vintage-style single-coil pickup with rubberised magnet, and a comfortable vintage-style "V"-shaped mahogany neck profile. If you're looking for a classic jazz-box experience, the Gretsch G9555 will provide you with the authentic tones and playability of the 50s. 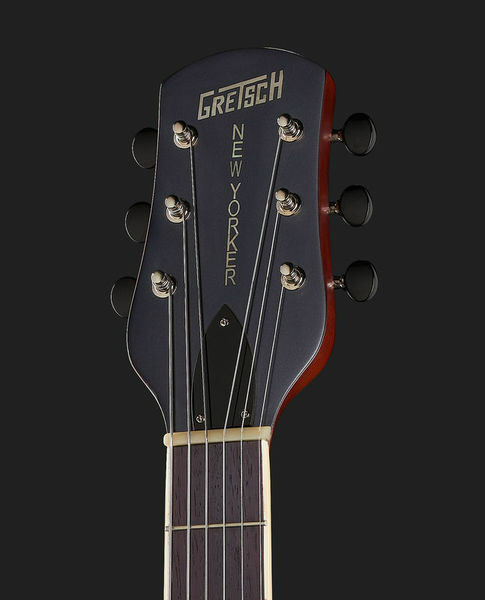 The Gretsch G9555 New Yorker Archtop comes from the Gretsch Roots collection, which aims to bring back classic guitar designs from decades gone by. This model offers the classic looks, tone and playability of the 50s jazz-box instruments, when acoustic arch-top guitar bodies were first amplified with pickups to be used with big-bands and in dance halls. Here you have a very comfortable large body instrument which effortlessly gives you jazz tones and aesthetics, whether plugged in or not. 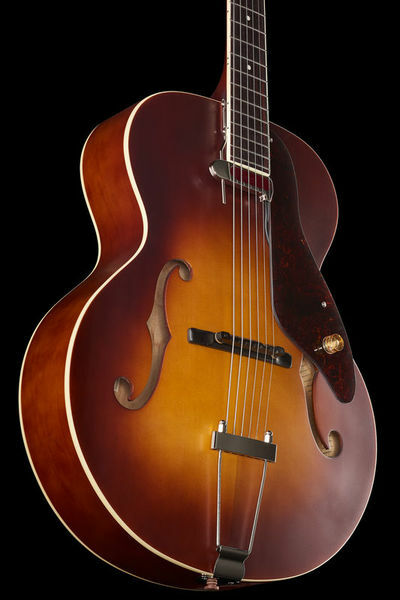 The G9555 is reminiscent of the classic 50s designed archtop guitars. Previously only acoustic instruments, they were later amplified with removable pickups to compete with larger bands when they became part of the core rhythm section. The G9555 features acoustic guitar proportions and many original design features, such as tortoiseshell-appearance pick guard and compensated rosewood bridge with trapeze tailpiece. It all comes together to give you the authentic jazz-box aesthetic. The G555 New Yorker's top is constructed from the well-rounded tonewood, spruce. This is commonly used on acoustic instruments and gives a lovely mellow resonance. 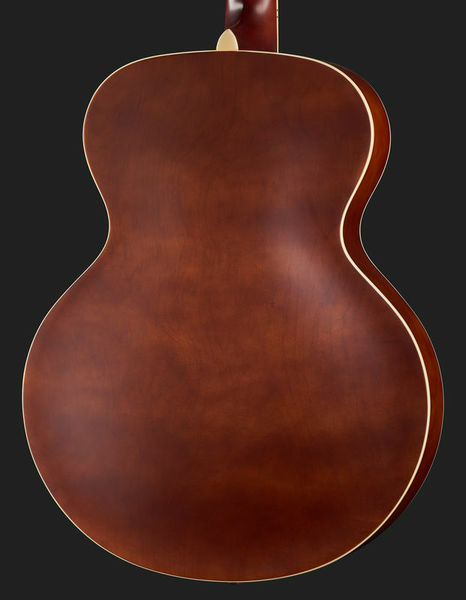 The maple back and sides provide strength for good acoustic projection. 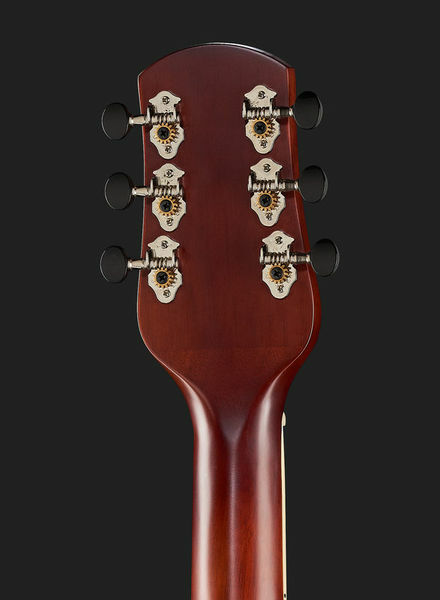 The mahogany neck gives extra sustain and warmth, topped with a katalox hardwood fingerboard. The G9555 features a comfortable body to sit down and play, while the vintage style v-profile of the neck provides a solid feel in the left hand. Here is a guitar with the comfortable proportions and light weight to be played long into the night.